Two of my oldest friends from the earliest reading days of my childhood: Charlie Brown... and Dennis the Menace. 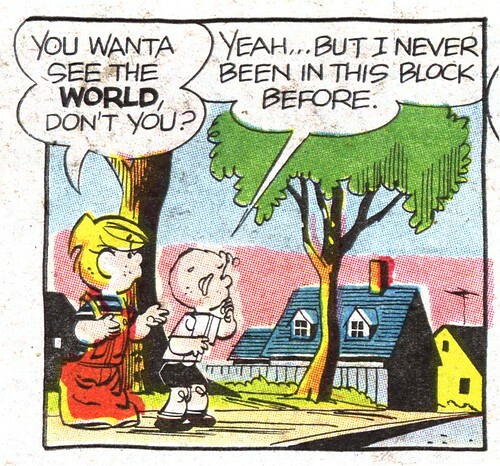 As a kid growing up in the early 70's, I used to clip the daily Peanuts strip and Dennis panel from my dad's newspaper. I'd keep them stacked chronologically, each in their own envelope, stapled together in the top left corner. 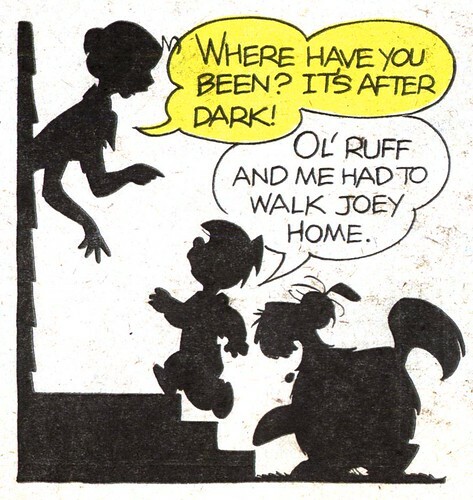 Even as a youngster I came to understand that these comics I loved were the work of two wonderful artists named Charles Schultz and Hank Ketcham. "One day," I told myself, "I'm going to be just like those two guys." A few years ago, a friend came across a huge stack of 1970's colour comics sections left behind by the previous occupant of a house he was renting. Knowing about my affection for that stuff, he gave them to me as a gift. And what a gift! - to be reunited with my old friends was sheer heaven! 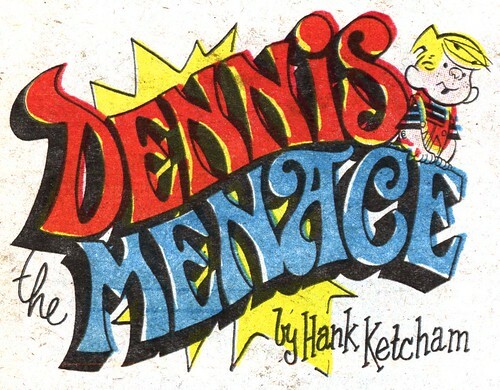 Here's the thing... last week I learned that all those Dennis colour comics I adored as a kid were not the work of Hank Ketcham at all. 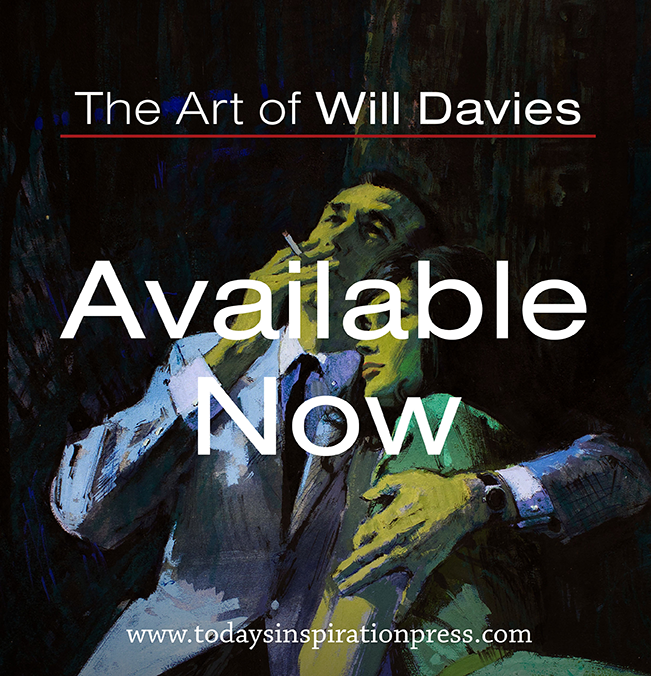 They were drawn, through all the years of my childhood, by Robert Bugg. 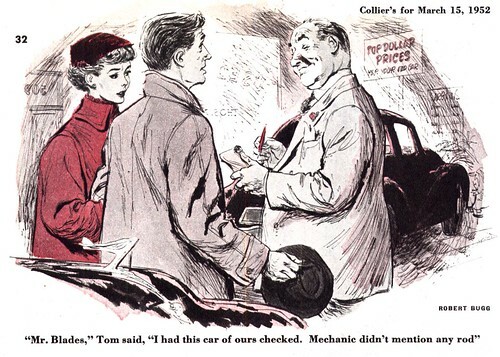 Yes, the same artist who we looked at last week and whom several people suggested had a style remarkabley like Hank Ketcham's actually spent more than a decade working for Hank Ketcham! That information comes from about the most reliable source one could hope for: Ron Ferdinand, who took over the Dennis weekend colour strip from Bob Bugg in 1982. Ron writes, "Your blog is actually the first non-DENNIS art I've ever seen of Bob's and it's AWESOME!" "When I started with Hank Ketcham in Monterey, CA in 1981, Bob Bugg had been doing the Sunday DENNIS since around 1969 from his home in Connecticut. Myself and two others (Karen Matchette and Brian Lum) had been hired to do the DENNIS comic book for Marvel. It was the start of a training program by Hank. As Bob Bugg's originals would arrive at the studio after processing, Hank would show them to us. It was very exciting to see Bob's work which the three of us were in awe of. " "After a year of working on the comic book, Hank and Marvel decided to part ways. Hank had invested in a beautiful studio in Pebble Beach, CA. After the comic book ceased production, Hank decided to focus on training us for the newspaper duties, primarily the Sundays at that point. He had first offered Bob Bugg the chance to relocate to California and work in-studio with Hank. Hank had envisioned all DENNIS art being overseen directly by him under one roof after moving back to California from Geneva,Switzerland." "Bob Bugg, who by that time had children and grandchildren in the Connecticut area, declined Hank's invitation. This, of course, turned into a lucky break for us trainees. Karen and I stayed on to produce the Sundays and some dailies while Brian left to work for Jim Davis and GARFIELD for awhile. Regretfully, I never did meet Bob Bugg." I asked Ron if he knew how Hank Ketcham first connected with Bob Bugg but Ron replied, "I'm not sure sure how Hank found Bob. Bugg was probably referred to him by the Connecticut group which Hank had been a part of before he headed West. There's probably still some folks in CT you can contact about info on Bob." If any of those folks happen to come across this post, please do drop us a line. We're all very curious to learn more about the talented Bob Bugg. 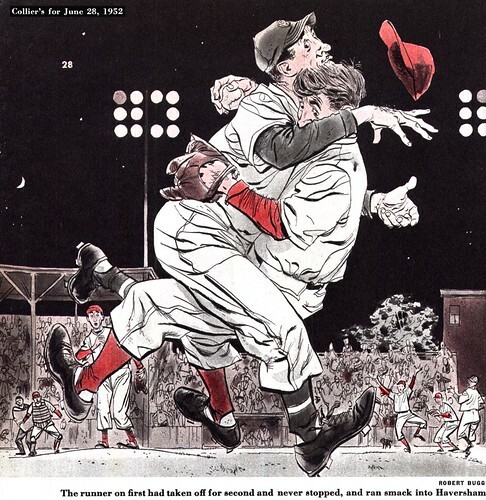 * My thanks to Marcus Hamilton, who draws the Dennis daily comic panel, for connecting me with Ron Ferdinand - and to Ron for sharing his recollections of Bob Bugg. You've consistently put up some truly amazing stuff here, thank you! My brain is exploding all over again. Fascinating and amazing work. I have no idea how you manage to make the time for all the scanning and posting involved, but again, thanks! Leif, this may or may not be the most relevant time to pose this question but here goes. 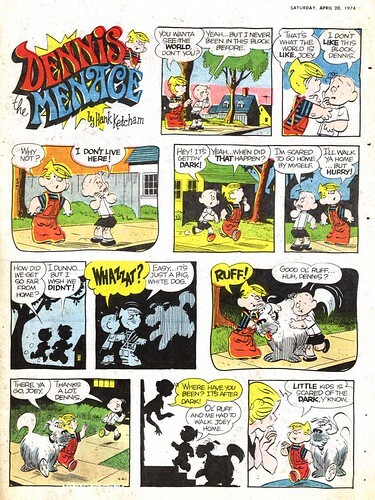 While we're speaking of the ghost work of Robert Bugg, does anyone have a clue of who drew the Dennis The Menace vacation comic books? 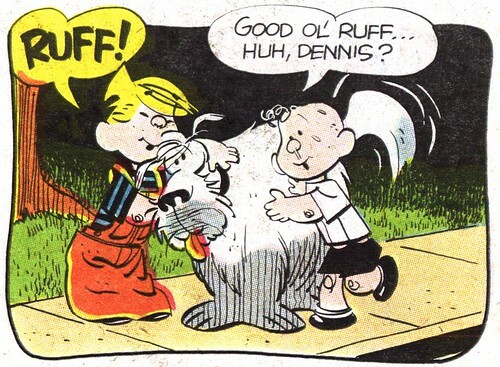 I've been a fan of that specific genre of Dennis comics since I was a wee lad. I was always at awe of the minute details of the ancient ruins or the elaborate architecture or the breathtaking landscapes of whatever places Dennis was visiting. The artist definitely didn't have that loose fluid style the other Ketchum ghosters strived for, nor did he/she attempt to. The artist went strictly for landscape/historical precision. I recently found "Dennis' Vacation in Yosemite" as I vacationed there not too long ago myself, and I'd love to track down more of those big fat old vacation comics--as well as suss out some history on the artist responsible for them. Thanks much for the Robert Bugg info'! Fascinating as hell Leif! I have two original framed Robert Bugg drawings and I am trying to find out what they are worth. Could someone please help me? Thanks!